Using natural face masks are excellent for the skin. Their skin healthy benefits are perfect for fighting acne, calming rosacea and soothing psoriasis. The beauty of using all natural ingredients in a "one time use" facial mask is you don't have to worry about preservatives or the product going bad. It is made fresh each time and the leftovers are tossed after application. It is perfect for all skin types including mature, dry skin. Basically making them safe, effective and completely sanitary! We have touted the benefits of using Oryza (Rice) Sativa many times in our other articles as to why it is so excellent for all skin types, especially those suffering from psoriasis, rosacea and acne. It is a natural emollient for soothing and softening skin while providing retention of moisture against the skin with slow oil absorbing properties also. It is this key ingredient we have built the success of our mineral makeup products on and why women are doing so well with our mineral powders to date along with our use of Jojoba Oil and Allantoin. 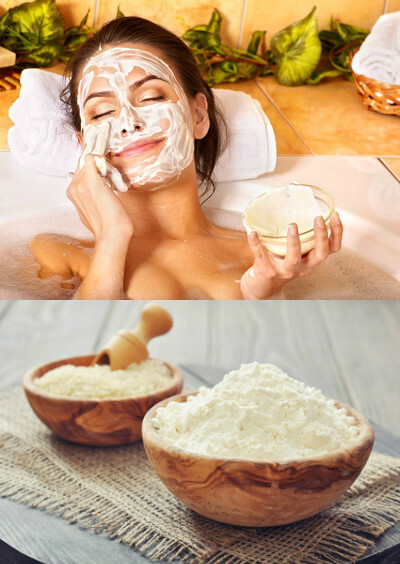 Now we wish to share a special treat just for you, an all natural recipe for "doing it yourself" skin therapy with a wonderful holistic facial mask made from Rice Flour, Goats Milk and Honey found right in your own kitchen. Very simple and fun to do and your skin will feel absolutely wonderful. It is non irritating and your acne will look and feel so much better after using this mixture. Rosacea and psoriasis sufferers will also enjoy the results and feel of their skin afterward. As with any skincare product whether homemade or off the grocery store shelf, do a small patch test to make sure you do not have a reaction. Well let's go play formulator! 6 Tablespoons Raw Rice Flour (organic if you can find it) Cosmetic Rice Powder will not provide an exfoliating benefit, yet still very soothing to skin. Mix these ingredients together and slightly warm in the microwave 10 -30 seconds on high. Time varies depending on power level. Stir ingredients again then test on forearm to make sure it did not get too hot. Your mask should have a paste like consistency, similar to oatmeal. If you like your mask to be a bit more runny, increase the goats milk. If you prefer it thicker, decrease the goats milk. Play with it and have fun, there are no rules, but simple experimentation! Cleanse and dry your face while your mixture is heating and cooling. Now apply your mask formula with your fingertips. For the best in mask performance, apply after you get out of a steamy shower since the pores and sebum will have been softened making for better cleansing and exfoliation. Or apply while taking a hot bath. Using a gentle circular motion, continue application until your face is completely covered. Keep away from delicate eye area. Once the mask is in place sit down and relax for 20-30 minutes. Now rinse with lukewarm water while slightly massaging skin again for further exfoliation until it is fully rinsed off. You can use this mask 2-3 times per week safely. Caveat For Rosacea Care: only massage face during application. Use once per week and rinse mask from face without further exfoliating massage. For mild rosacea with acne this mask can be used up to 2 times per week. With rosacea you want to guard against over stimulating the skin too much. This mask is about as gentle an exfoliator as you can get, yet just take it easy until you figure out what works the best for your delicate skin. We then recommend a followup with your Perfect Balance Facial Toner for toning skin and tightening pores, followed up with your favorite skin cream or your Vitamin Rich Facial Serum. Never a better time to use these skincare products than while the skin is fresh, clean and softened to allow for maximum absorption of nutrients. Rice Flour ~ is great for providing the exfoliation in the form of a slightly gritty texture, not to be confused with our modified, cosmetic grade Rice Powder we use in our mineral cosmetics as this is silky and non gritty. Raw Rice Flour maintains a more pronounced level of the moisturizing properties and you can feel it when you rub it between your fingers. This will help the acne and remove dead skin cells, blackheads, whiteheads and simply provide an all over moisturizing gentle exfoliant for the face. Goats Milk ~ Goats milk has the same pH level as human skin which means it will not leave your face feeling dry. It is also a natural anti-inflammatory, natural exfoliant (alpha hydroxy acid) and has antibacterial capability, killing the bacteria which causes acne. It will also saturate the skin with essential nutrients of Vitamins A, B, C and D. Goat Milk by Meyenberg can also be found in dry powder form and rehydrated with distilled water for each individual use. It will also store better than fresh goats milk or canned goats milk. The dehydrated version has a shelf life of 4 years. 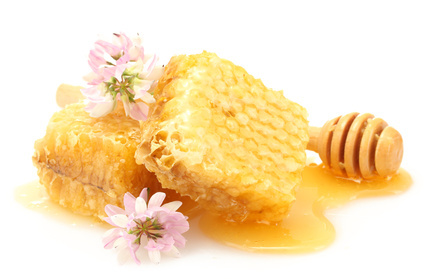 Raw Honey ~ It is full of vitamins, minerals, amino acids and enzymes. It has an emollient property, is soothing and is a natural humectant. This helps to smooth roughness and calm irritations of the skin. It has natural cleansing and antibacterial properties and since bacteria are unable to live in honey, it demonstrates its natural preservative capabilities. This perfect emollient leaves a micro thin protective film on the skin. WARNING: sweetness may be hazardous to creating a desire to eat your mask instead of using it on your face. Jojoba Oil ~ It aids in the reduction of acne, healing of skin irritations, and will help minimize scarring. It is soothing for those with rosacea, sebborheic dermatitis and psoriasis. It is excellent for decongesting facial pores, stopping the over production of natural pore clogging sebum and for restoring your skins' natural pH balance. Jojoba oil is a powerful anti-oxidant and is rich in Vitamin E, Vitamin C and contains minerals of Chromium, Copper, and Zinc. It mimics our own sebum, and will act as a replacement for the loss of natural oils and collagen as our skin matures, making it excellent for fighting wrinkles. It aids in smoothing surface roughness, flakiness and fine lines. This ingredient is also used in our mineral makeup foundation formulas for preventing dryness and controlling sebum production. And of course, for its' other well known holistic properties. All of these can be found at your local food coop or health food store for the most part. Even some grocery stores will have a health food section for getting most of these items. Don't forget, there is also internet shopping especially when wanting the dry goats milk formula which can be located in the link we provided above. Rice Flour may need to be purchased from your local Asian market. As a rule, we have to go to the local Asian market since we could not find raw rice flour anywhere else. The best part about it too is it is inexpensive and will store in an airtight container for up to 2 years. Try it this weekend to reveal a brighter, healthier new you with glowing skin. Watch for more natural beauty skincare recipes in the future. Also let us know how it did for your face...we would love to learn about your results with this soothing, healing mask.